If you’ve ever trawled through recipe books looking for interesting ideas for a special meal or dinner party or for inspiration for allergen friendly canapes, this brilliant recipe is well worth considering. It was a complete success on the first attempt of making them and went down very well with my lovely guinea pig guests and they were really easy to make. I used Gluten Free Goblin’s blini recipe and tweaked it so it was freefrom milk, pesto and tomatoes. 150ml rice milk (plus 1-2tbsp) – you could use any milk. Put all the ingredients (except 1 tsp oil and 2 tbs of milk) into a bowl. Using a hand whisk, mix well removing as many lumps of flour as possible. Once mixed, cover and rest in the fridge for 30 minutes. Remove from the fridge and whisk in the remaining oil. If the mixture has stiffened up too much you may need to add a little milk to loosen; 1-2 tbsp was about what the mixture needed but add more of less. The mixture should be fairly runny and pour well from a spoon into the pan. Heat a little oil in a frying pan and put spoonfuls of batter into the pan. Use a dessert spoon and cook 5-6 at a time (but you can make the blinis any size you like). The first few are never quite as good as the rest, but they cook quite quickly. Allow to cook for 1-2 minutes, until they puff up and little holes appear in the top side. Carefully turn the blinis over and allow to brown. Continue frying until all the batter has been used up. This is a little time consuming but quite enjoyable – try not to eat too many while you are cooking! Serve straight away, they taste amazing warm or you can store in the fridge for up to 24 hours. Alternatively they also freeze very well. You could also serve them with parma ham, sun dried tomatoes, roasted red peppers, sliced olives or capers. Sunflower and pumkin seeds, spinach, watercress, streaky bacon… the topping choices are endless. I had them with smoked salmon, chopped spring onions and nori flakes while my guests had a combination of horseradish sauce, soft cheese and smoked salmon. They all got eaten so none to freeze! “They tasted great and you couldn’t tell they were gluten free at all, if you didn’t tell anyone they wouldn’t know.” great praise from the very discerning palate of Mr What Allergy. There are some really nice dairy free soft cheeses that would work well too. 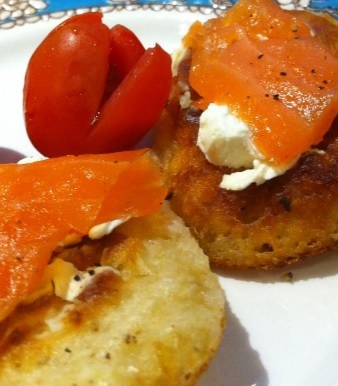 These blinis are now a new favourite of mine and I will definitely be making them again. Karen brought along parma ham roled with seared pear and rocket which were delicious and totally allergy friendly and Bloody Mary tomatoes which, after some nervous trepidation, were also a big hit. I couldn’t eat these due to my tomato allergy but they would be great for anyone with allergies because they are also totally freefrom all major allergens! Thank you Karen! The rest of the meal consisted of ginger and mustard marinated chicken breasts with garlic and rosemary potatoes and steamed vegetables with damson and apple crumble for afters. Thank you for coming Karen, David, Fran, Simon, Becci and Craig. Some great memories, lots of laughs and it was so relaxing for me, being totally in control but also having my lovely friends around me. Less wine while cooking and more attention to timings next time though!